Whale Wants To Give You $10,000 If He Can’t Help You Win. You Interested? I’ve done it again! Yesterday, I enjoyed another big winning day, where I wagered $25,450 and ended up cashing out $45,117.93 for a net profit of nearly 20 grand! In just the last 2 days of betting on sports, I’m now up $25,000 in profits! Today, I accelerate hard and bet $42,000 on my picks. I’m dead set on my mission to prove to you that I can win a million dollars off one winning streak this baseball season. I’ll share with you my actual betting tickets in a bit since you are a paid member. But first, here’s an update on how things are going with our program. I’m in the process to become the premier expert at the largest handicapper service. We are developing own sports website and apps for sports bettors, fantasy sports players, and casual sports fans. Imagine: Wouldn’t it be nice if there’s an app to immediately alert you with a text message if your team’s starting pitcher has changed, or if the Total score of the game has finally gone Over at any point in the game? Of if the halftime show is finally over and the 3rd quarter has just tipped off? We’re entering into the top networks to attract thousands of new clients and social influencers. We’re creating printed how-to books and sports schedules to be distributed worldwide. We’ve hired the leading experts to help us toward a rapid multi-million expansion. Ultimately, my actual success on my picks is what matters. You’ll see that I will continue to pound away every single day on my bets. In the month of May, I have now wagered over a million dollars on my picks, and I’ll continue to accelerate as I get hotter. Take today for example, where you’ll see me put down $42,000 on my selections. If all goes well, then today might be a $100,000 day! The Whale’s Guaranteed Profits VIP Inner Circle: I guarantee that you will make at least $10,000 in profits by betting on my picks. And if for any reason you don’t, I will personally give you $10,000 of my own money. Are you interested in this kind of a guaranteed profits VIP offer? We haven’t finalized the details yet. But the preliminary idea here is to guarantee that you’ll make at least $10,000 with my picks, otherwise I’m going to take $10,000 of my own money out of my pocket and give it to you. 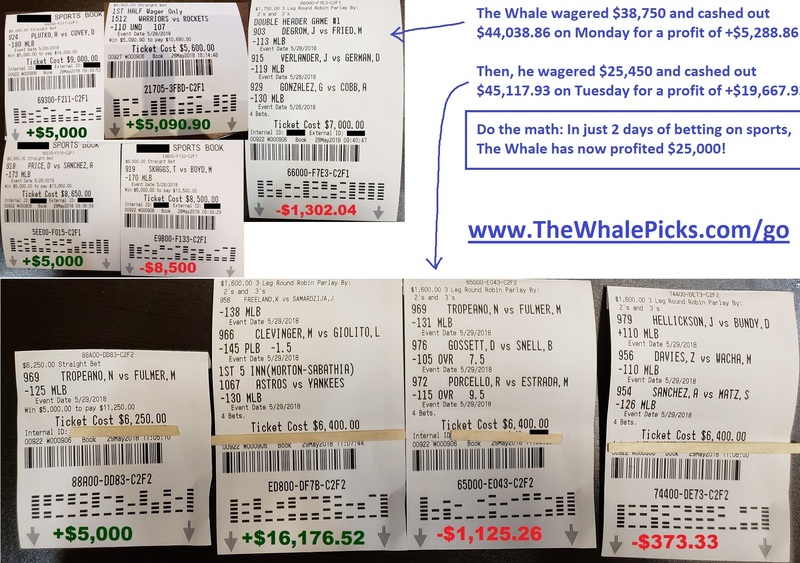 Please comment on this blog if you are interested in this guaranteed profits VIP offer where The Whale guarantees you’ll make at least $10,000 with my picks, or else I’ll give you $10,000 of my own money to make up for it. While I show that I truly believe that I can make a fortune from betting on my own picks, am I also confident that others will be able to do the same? If so, then how can I put my money where my mouth is to prove it? That’s how we came to the idea of The Whale’s Guaranteed Profits VIP Inner Circle. The idea of this program is that if I cannot help you make profits with my picks, then I’ll just give you the money himself to make up for it. Again, please note that we haven’t fully finalized the details yet, so please don’t take everything said so far in this email as if it’s 100% set in stone. But if you’re interested in this kind of approach where I guarantee you profits otherwise I’ll give you the money out of my own pockets myself, please comment on this blog and I can keep you in the loop as we open the doors. Today, I bet $42,000 on my picks. If I cannot help you win today, I’ll lose $42,000!